Most internet users have switched from PC to cell phones because mobiles are lightweight devices that easily fit into the pockets. You may have been using a PC or mobile device for several years now. Do you know that the color display of your computer and smartphone transmit different invisible rays of various wavelengths (intensity)? Bluelight is one of the most harmful rays transmitted by a color monitor. Studies prove that blue light makes reading eBooks or content during the daytime a great experience. But after the evening, prolonged exposure of blue light to the eyes isn’t good. 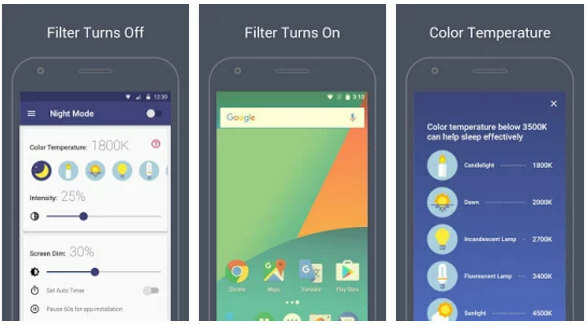 Some versions of Android OS allow users to turn on auto brightness feature which ensures that the brightness of the display is decreased automatically according to the time of the day. You can find this option in the display settings of Android OS. The major drawback of this setting is that it doesn’t have any impact on the blue light. Because of this limitation, eye experts advise people to limit the use of cell phones during the night. If you want to protect your eyes from intense blue lights transmitted by the mobile’s display, try out one of the below 5 best Android night mode apps. The app adjusts the display color temperature as soon as you run it. BBFC allows users to select colors that make their eyes comfortable. You can set the display color temperature with a slider. 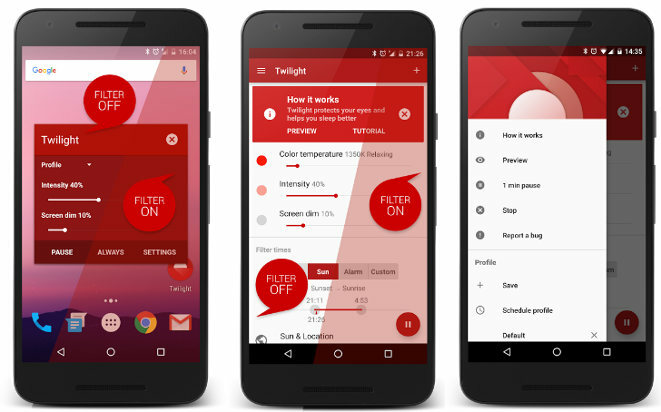 This application enables you to define sunset time. It provides an option to set display intensity. It ships with an opacity filter, with which you can activate or deactivate the app’s dark or light UI. The app adds a toggle option to the notification panel so that you can turn on/off its core functionality. Has plenty of premium features that should have been free. 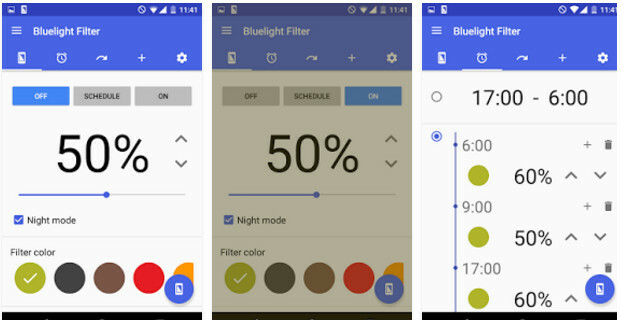 Yet another excellent application to fix Bluelight intensity issue on your smartphone, this app assures that your eyes won’t feel tired or hurt when you’re using the phone after the sunset. BLF lessens Bluelight emitted by the display. Hence, it helps you sleep better. BLF allows you to set the Bluelight intensity manually. It also enables you to change the screen brightness. Once you decrease the brightness, the battery in your phone will last longer. The app has an auto timer function and a quick switch button. Unlike other Android night mode applications we’ve covered here, Twilight identifies your location automatically. The app works great on smartphones powered by AMOLED displays. Users can configure it to prevent changing screen color temperature when they’re running a specific application. This app lets users save your settings to Google drive. It provides a quick settings dialog box. Twilight is a lightweight application. It supports Android 7 and higher operating systems. Once you grant the above two permissions, run the app and tap on its main screen. 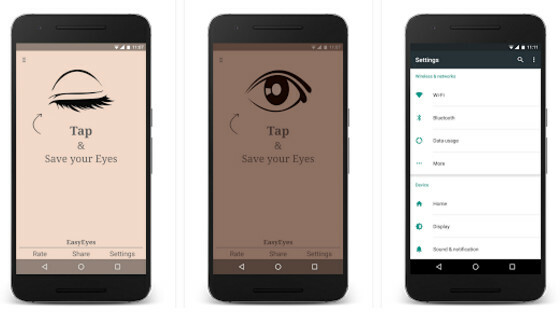 EasyEyes allows users to change the display color temperature and brightness level. It lets you revert the original brightness and temperature levels with one-click. F.lux is one of the most popular Windows/Linux Bluelight filter applications. Several million people use F.lux every day. The application made its way to the Google Play Store last year. It is still in the beta stage. F.lux reduces the emission of the deadly Bluelight rays during the night. The app shows its magic once the sun sets. As developers haven’t released the official version of Flux, the application may not work on some devices. Conclusion: If you don’t want to suffer from impaired visions, headaches or vision loss, install and activate one of the above night mode Android applications. We’ve have shared apps that support all types of touchscreen displays. The applications are user-friendly. Although they run in background mode, the apps won’t affect the performance of the Android OS. How about wearing an advanced computer glasses ? Not a bad idea but the type of glasses you’ve mentioned are not available for free. I use Blue Light Filter Night. When I take screenshots while it’s activated, my pictures get saved like that. Is there a blue light filter that doesn’t have this glitch?